I lived in L.A. for five years. There’s a reason they call it “La La Land.” Aside from the entire state of Florida, one could argue that Hollyweird holds more loons per capita than anywhere else in the free world. We even wrote an article on the various types of a-holes you’ll meet in the City of Angels. 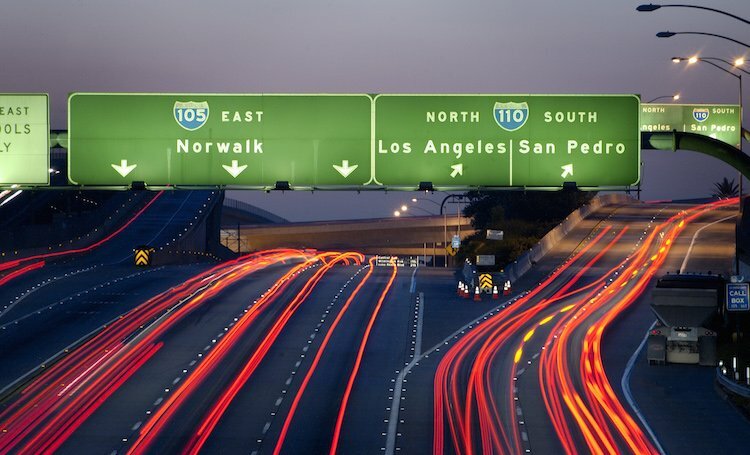 The most hated man in Los Angeles this week is most likely the bro below who thought it okay to climb an overpass sign on the 110-freeway, holding up traffic for hours. The dude pulled open some protest banners and danced, only wearing his underwear. Oh, and he also stopped for a smoke. This class-act shut down traffic for two hours in a city that is already pure hell-on-Earth when it comes to transportation. Here he is striking a pose for the cameras. And here he is doing what appears to be a self-imposed rap battle while emulating Patrick Bateman from American Psycho. Finally, he gave in to his inevitable arrest by doing it in style with a backflip onto the airbag. At least those watching nearby had some free quality entertainment. Some still shots, for your viewing pleasure. So who is this American ninja? Non a-holes in L.A., hang in there.